Please contact us for estimated delivery date. 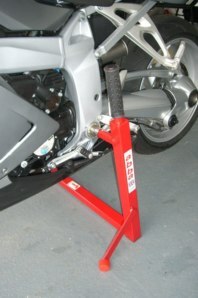 The BMW specific Superbike Stand is suitable for the K1200 S&R, BMW K1300 S&R & BMW R nineT motorbikes. The fitting kit included is the same for the K1200, K1300 & R nineT models. 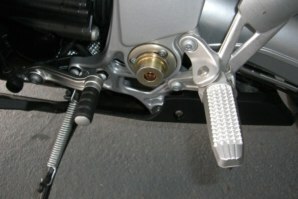 One side of the fitting kit is to be fitted to the bike itself prior to using the stand. 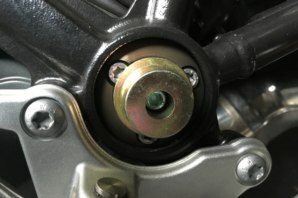 As you can see below the abba fitting (gold color) is fixed to the bike by removing the centre bolt from the BMW swing arm disc, once removed the abba fitting is a perfect fit to locate inside the disc recess and is then held in place by a screw (supplied in the kit). This is a very quick and simple fit and takes a matter of seconds to complete. This fitting can be left in place at all times (we recommend you use a thread locking agent) or fitted before each use of the stand if you prefer. The opposite side of the fitting kit is a male pin that inserts inside the 12mm hex key hole on the bike, this part remains on the abba stand and is not to be fitted to the bike. (Below Left: R nineT Right: K1200) See below for K1300. 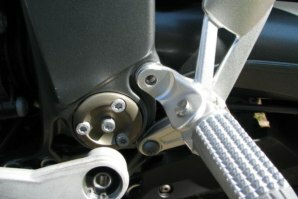 This Product is designed and manufactured for the above named motorcycles. Therefore this stand cannot be used on other motorcycle in the future unlike the normal abba superbike stand. Key Features of the Bmw K1200/1300 Superbike stand at a glance. 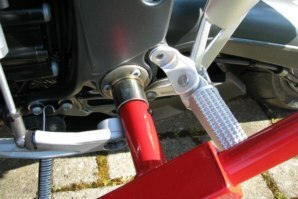 The BMW "K" range superbike stand functions the same as standard abba superbike stand shown below. 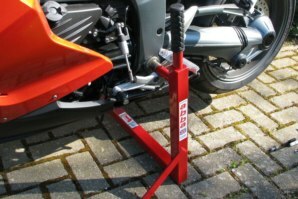 I purchased my front lift and K1200S stand at the London Motorcycle Show this year and i was told that you were unable to supply the stand for 6 weeks.I was pleased to receive my stand in just over 2 weeks.Imust say that i'm very impressed by how easy it is to use and how stable the bike is when on the two stands.A big thanks again. 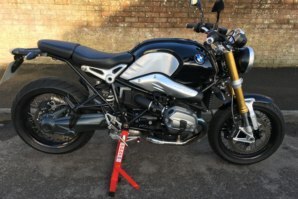 No Permanent modifications are required however the Specific BMW fitting does have to be fitted to the bike itself before fitting the stand. This can be left in place (Not in the case of the K1300 model) or simply fitted before each use of the stand. Is it safe to leave my bike on the stand long term - i.e winter storage? Of course! Thats what the stand is designed for, you can leave your bike on the stand indefinitely. 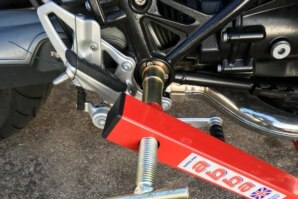 In fact if you do not use your bike for one day or one year the stand will keep your bike safe, upright, prevent unnecessary flat spots on tyres and compression on shock/fork springs (which occurs using single sided paddock stands). 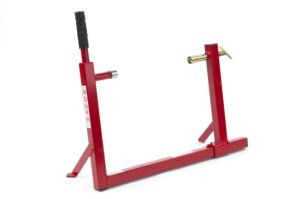 Can this stand be fitted to any other bikes? Unfortunately not. This stand is only designed to work on the K1200, K1300 S&R and BMW R nineT models as the dimensions of the stand are specific to these particular BMW shaft drive models. 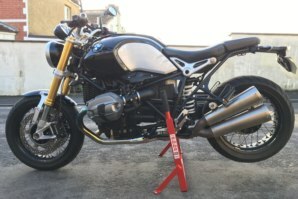 Got a Question about the abba K1200/13 & R nineT Stand? If you would like to ask us a question about the abba K1200/13 & R nineT Stand, simply fill in the form below and we will contact you within two working days. 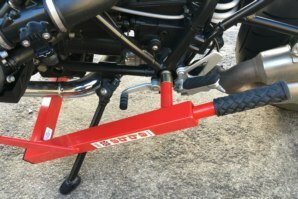 Want to tell a friend about the abba K1200/13 & R nineT Stand? Alternatively fill in the form below and we will send an email on your behalf to your friend, with a link to this page all about the abba K1200/13 & R nineT Stand.